Smart Realty & Investment Services – A full service discount brokerage. A full service discount brokerage. HIRE THE BEST WITHOUT PAYING A FORTUNE OR SKIMPING ON QUALITY! We charge you just 1.5% to list and professionally market your home. If we also procure the buyer, you pay only half a percent (.5%) more. If a cooperating broker procures the buyer, you pay 2% more. In total, you pay just 2% to 3.5% total commission. That’s a savings of 42% to 67% off the standard 6% commission (rounded). So, if your home is worth $1 million, you save $25,000-$40,000! Now that’s Smart! Learn More. Just because you save a fortune does not mean you have to skimp on service. With each transaction, we offer our Smart Suite of Services developed from years of experience selling homes just like yours. Smart Realty has systematized and simplified the process to make it as smooth and painless for you as possible and maximize your sales price. Learn More. We accurately estimate the price of your home using the complete MLS database and help you set the price in line with current market conditions and trends fine-tuned with your home’s unique qualities. Learn More. Using our extensive sales and property management experience, we comb through your home to identify repair issues and Smart ways to best stage your home for the maximum price – within your budget. Learn More. We use Smart photos, HDR and 360 panoramas, and drone footage to highlight your home’s strengths and attractively position it against the competition. Learn More. We market your home through its own www website PLUS: the MLS, Re/Max, First Team, Century 21, Zillow, Trulia, Redfin, Purple Bricks, Realtor.com, Facebook, LA Times, and more. We also don’t engage in the unethical practice of pocket listing. Learn more about: The 5 P’s of Marketing. We are either selling the house or conducting Marketing Research consisting of Qualitative and Quantitative methods using our Smart Open House Questionnaire. We structure the sales agreement to maximize your sales price and minimize your risks. We then work hard through the escrow period to smoothly close on time. We are available 24/7 by phone, text, email, Kakao and other messaging apps, and your personalized webpage for continuous feedbacks, status updates, and answers. Trust is a scarce commodity. It cannot be bought but must be earned. Our mission is to provide the highest quality real estate services at significant discounts by specializing in the sale, purchase, management, and 1031-exchange of single and multi-family residential properties using our state of the art knowledge of technology and photography as well as using our advanced business, marketing, and negotiation skills garnered from years of experience – all with the ultimate goal of fulfilling our fiduciary duty to you to the fullest and earning your trust, loyalty, future business, and confident referrals. In short, our objective is to provide you with the highest level of service tailored to your unique needs and objectives without costing you a fortune by using state of the art standardized services that maximize your sales price. 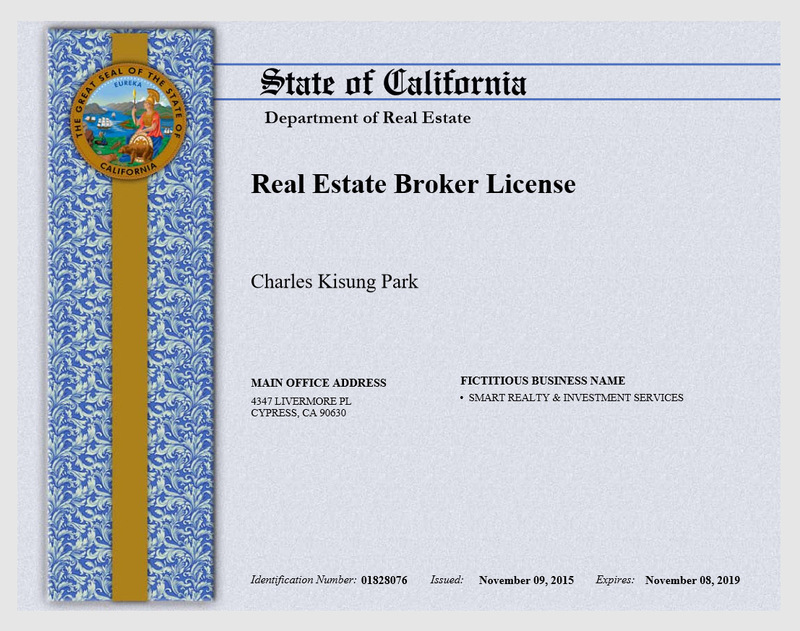 California Bureau of Real Estate Broker License #: 01828076. Licensed Real Estate Broker Since 2007. Licensed Notary Public Since 2005. Orange County “Native” Since 1975. Was Marketing Research Analyst for Epson America, Princess Cruises, & Parents Magazine. Has an MA from UC San Diego and BA from UC Berkeley.Fluent in English and Korean (한국어). Broker Charles K. Park’s Curriculum Vitae. Broker Charles K. Park’s DRE Broker’s License. Southern California – Los Angeles, Orange, and Riverside Counties; CA Cities of: Cypress, Buena Park, Stanton, Fullerton, Cerritos, Hawaiian Gardens, Long Beach, Lakewood, Anaheim, Garden Grove, Westminster, Huntington Beach, Fountain Valley, Seal Beach, Los Alamitos, Norwalk, Artesia, La Habra, La Mirada, and neighboring cities. BUYERS: We pay 100% of your escrow fee! Selling or buying one’s home can be a complex and time-consuming process full of risks. Smart Realty is the Pro you can trust. Earn thousands more on the sale of your home. Call us today and we will show you how.